Above: This rare photo shows the old Macclesfield to Buxton road as it snakes towards the horizon. The circled house is Marchington Farm. The next building is Moss House. Further along on the right is Moss Hall, and lastly Goyt’s Moss Farm, which now serves as a Rangers’ centre and public toilets. Today, the lane running from right to left leads to Errwood Reservoir. Rob Marchington recently got in touch to say that his family once lived at Marchington Farm; one of four farmhouses at Goyt’s Moss, close to the source of the River Goyt, just down from the Cat & Fiddle Inn, on the old Macclesfield to Buxton road. Today the area is more popularly known as Derbyshire Bridge (walk 11 starts from here). The farms were referred to by my father’s generation as they had long memories handed down. Goyts Moss wasn’t prime land by any stretch of the imagination but it wasn’t the moorland that we see today. The family, along with Swindells family, scratched out a living by small-holding, along with digging out coal – bagging it and selling it in Buxton, along with a stone quarrying business. The family moved on after the 1851 census due to the hard living, dispersing around Chapel and Buxton, and down to Aston in the Birmingham area as they had a link with supplying stone there, and ended up running a road construction business given their involvement in stone pavers. Humphry Marchington, who lived at Castage farm for a period and had a side-line on a coal seam near the farm, also did work for the tramway on the other side of the valley. The tramway Rob mentions must have been the Cromford & High Peak Railway. 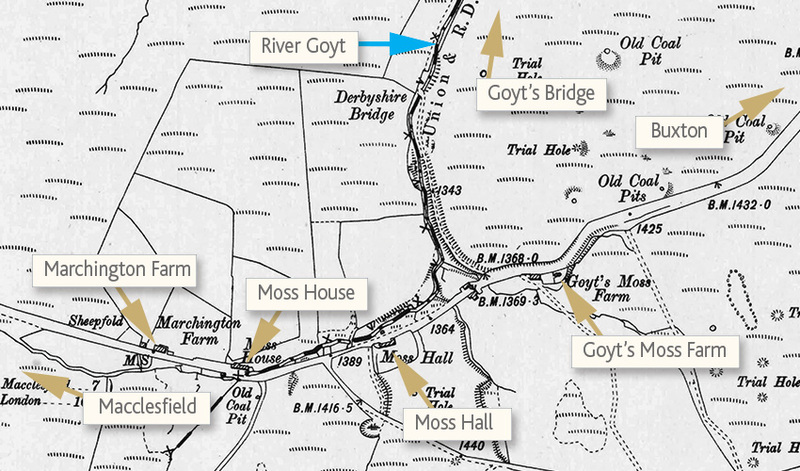 Looking at old maps of Goyt’s Moss (click to enlarge), the area was peppered with small, open-cast coal mines. It must have had a rich history, lying beside a junction of important trading routes across the windswept moors. I’ve managed to find photos and some information on three of the four farmhouses: Marchington Farm, Moss House & Goyt’s Moss Farm. 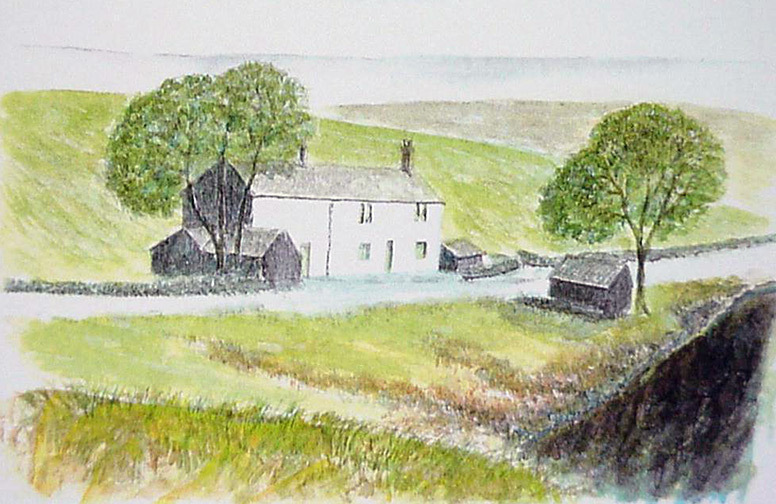 But very little on Moss Hall, apart from the illustration below which may show the farm house, although I’m not 100% sure. In the photo of the three houses (see top), if you’re coming down from the Cat and Fiddle, Marchington Farm is the first house. Next on the left is Moss House, which was the home of the Swindells family who are featured in the photo standing outside it (above left). Further on – as you get to the dip and then slightly climb the hill towards Buxton – on the right is Goyt’s Moss Farm. 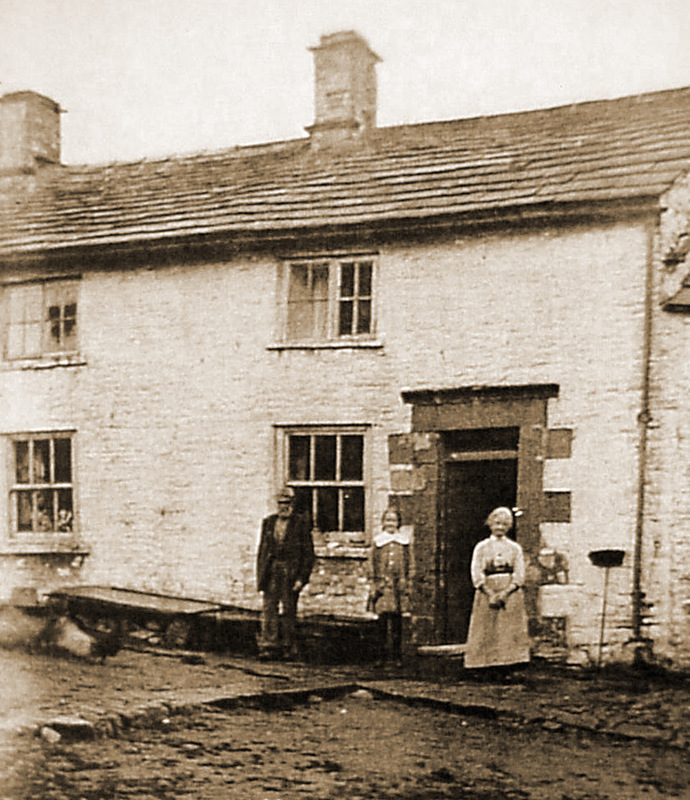 This, according to my research, was a much older building held by my family and was in such poor condition that they moved to Marchington Farm, and Goyt’s Moss Farm was rented out to others pre-1841 census. I think Rob may be confusing Goyt’s Moss Farm with Moss Hall. Moss Hall was the third building along the lane. Goyt’s Moss Farm was the last of the four farmhouses and is the only one to have survived (although probably rebuilt), serving today as a Peak District Rangers’ hut and public toilets. Rob also sent this illustration which is captioned ‘Moss Hall Farm, c.1910’ (click to enlarge). If it is Moss Hall, it’s the only representation of the farm house I’ve seen. The position looks correct – on the right of the old Macclesfield to Buxton road, opposite an exposed area of coal shale. Today all that remains of Moss Hall is a small area of flat ground. I’ll update this page if I manage to find any more information. Can anyone tell me anything about the feature marked on the O/S map as ‘Jacobs Cabin’, NW of Derbyshire Bridge?